What has your clicker trained horse offered? There’s no doubt he was a handful; I was always careful when I was around him. Protective contact and slow, methodical training of alternative behaviors turned him around. What I love about this little horse is his intense curiosity; in so many ways he is fearless. Today the training was no exception. We wandered around the area that surrounds his turn-out pasture. We began to explore the various farm equipment that helps make the human’s part of horse ownership work more smoothly. In this case we let the quad and attached trailer be the focal point of our games. McKee has some reliable cues like “Step up” “touch” “walk-on” “back” and “whoa” that are a part of how we check out new things. 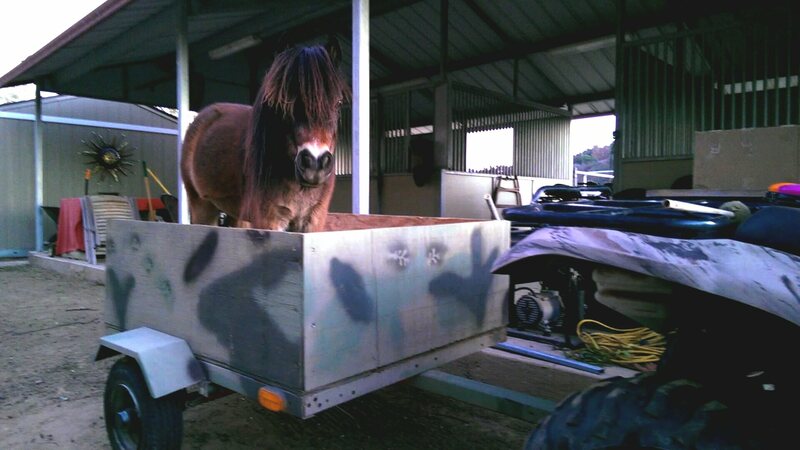 Today he let it be known just how brave he was when, after using the little tool trailer as a pedestal, he decided to step up INTO the back of the trailer. No problem. Despite being treated to thousands of little gifts of offered behavior from horses, I am STILL in awe of what a horse will give when he has choice, time and a strong history of being reinforced for his efforts. Lucky me. Truly a gift of a lifetime. This is very cool. I love your newsletter! Thanks Emily, going to see if I can blog a little more regularly. So is there a topic you are interested in?